Graded NM-MT 8 by PSA. Hall of Famer, and a scarcer "High Number" entry. Among nearly 1,700 copies recorded in PSA’s census reporting, just nine examples have been placed at a higher, unqualified tier. An elegant example of Willie Mays' true rookie card is presented. Although he started the '51 season with the Minneapolis Millers, Mays was soon summoned to the parent New York Giants, where he proceeded to capture the National League's Rookie of the Year crown. He also inspired the team to the World Series for the first time since 1937. 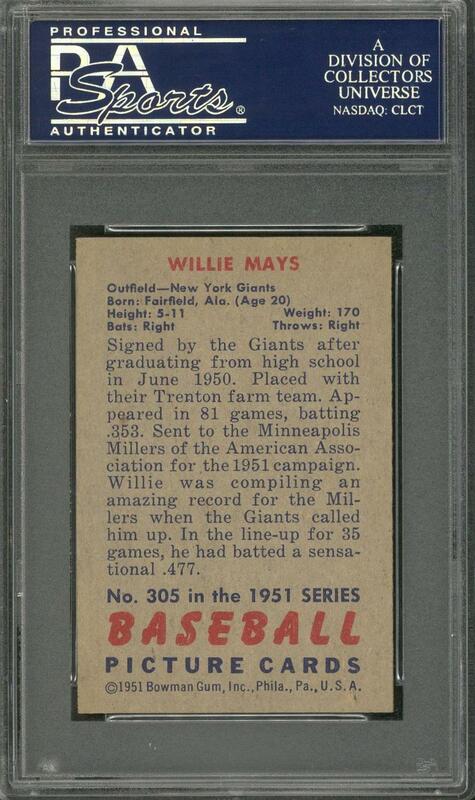 This card, of course, marked his introduction to a public that came to revere the magnificent centerfielder who, it is often argued, became the finest of the so-called "complete" players in the annals of the game. His horizontal debut-year pose, seen here, reveals the intensity and fierce competitiveness the great player carried on the field for 22 years. His career total of 660 home runs still ranks high on the all-time list, and he added another 283 hits after joining the 3,000 Hits Club. 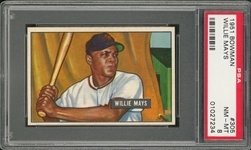 Mays led the league in stolen bases for four consecutive years, from 1956 through 1959. He was indeed the complete ballplayer, and the starting point of his glory is illustrated delightfully by this exceptional keepsake. Visually, the card is very pleasing. Its superb registration and bold colors are framed by snow white borders. Freshness of gloss, centering of design and overall aesthetic are all immune to challenge. Stellar Near Mint to Mint condition.